2012 Spring Retreat with headliners Bonnie Wakeman and Ron Hansen! Due to the nature of Bonnie's class, retreat size is limited. 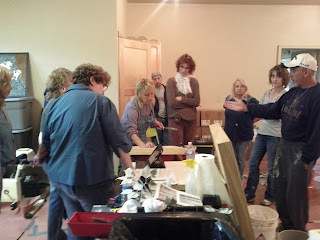 *Bonnie Wakeman’s spectacular Bas Relief class. All retreat students will get their own blog set up. Faux challenge – Win awesome prizes. Everyone truly has a wonderful time at the retreats. There is nothing else like them and they are all unique. After your daily classes you will enjoy sumptuous meals, s'mores around the campfire, Zumba or Salsa dancing, massage or sip wine by the fireplace. . If you prefer some alone time you can go fishing or go for a hike around the lake. Canoeing, boating, fishing, hot tub, sauna, Wii are also available. We had an incredible retreat! Such talented instructors and students, it was a very special time.